BrightPay facilitates the ability to force include an employee's starter declaration on an FPS submission that covers a different period to the employee's starting period. All employees for whom a start date in the current tax year is detected will be available for selection. 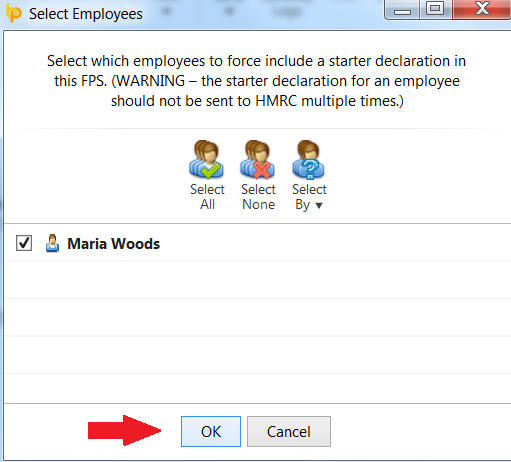 Select the employee(s) you wish to force include a starter declaration for in the FPS selected and click OK. Please note: care should be taken that the starter declaration for an employee is only sent once to HMRC. The employee(s) starter declaration information will now be included in the Full Payment Submission for submission to HMRC.